With the heatwave and high humidity in New York City at the beginning of July, I wondered when exactly I’d have a chance to photograph my completed sweater. On the first Saturday of the month, however, I woke up to a mere 65 degrees. The humidity was low, the sky was blue, and I knew it was a perfect day for pics. Cobblestone fabric is 100% cotton, but it’s a little heavier than summer weight. It will be great for the fall. It was certainly perfect for a cool summer morning. 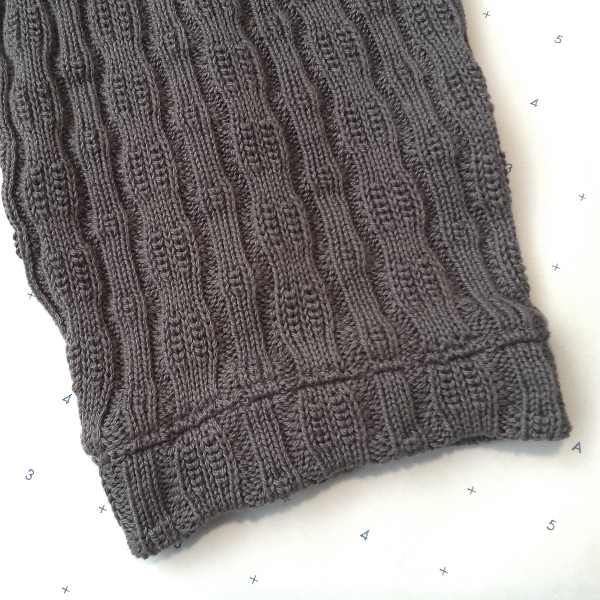 I’ve shown bits and pieces of the Cobblestone sweater in progress. 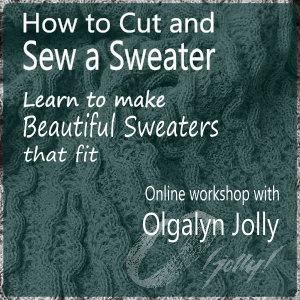 You may even have seen a part of the sweater that’s no longer there! This was the original cuff, constructed with self fabric, the same pattern piece as the sleeve. But the sleeves were too long. For sleeve version two I cut the length and reduced the width at the bottom of the sleeve. I then installed a more traditional cuff made from a finished edge rib band trim like the neck band. 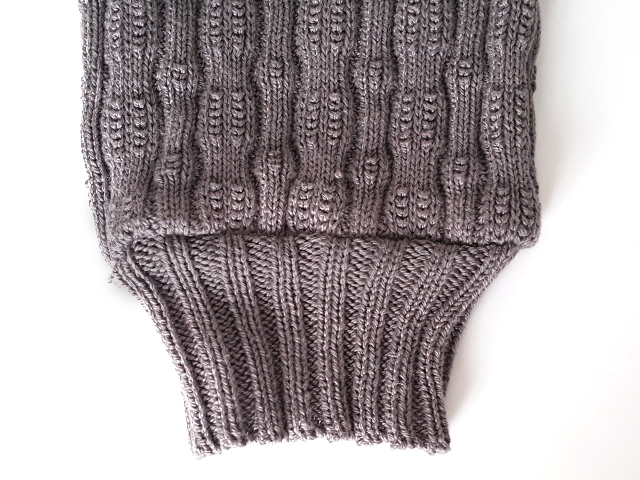 The resulting sleeve was an inch shorter. 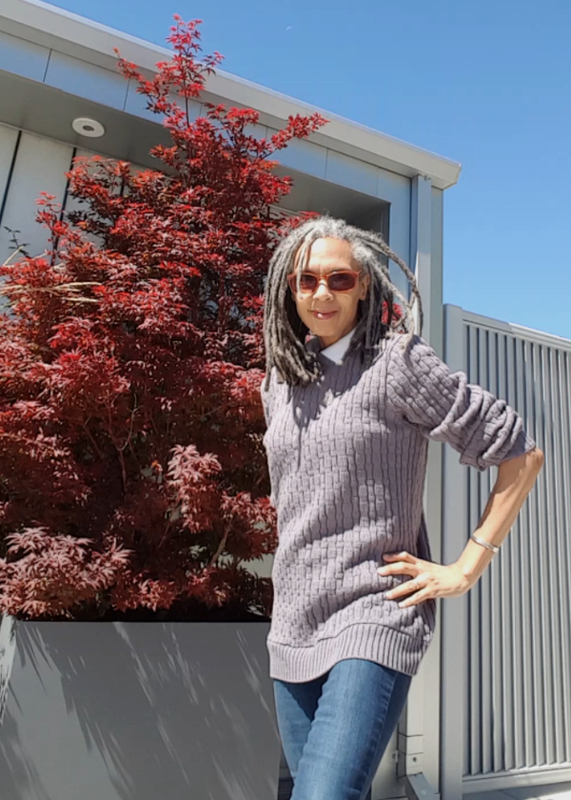 The sweater is based on the McCall’s 7660 I used for a demonstration this past spring in New Haven at the Northeast Machine Knitters’ Guild. Yes, these pattern pieces have been cut out and partially assembled for a few months now! I cut the longest length of the pattern, the one that was intended to have a hem. Then, instead of hemming, I added a rib band for even more length. 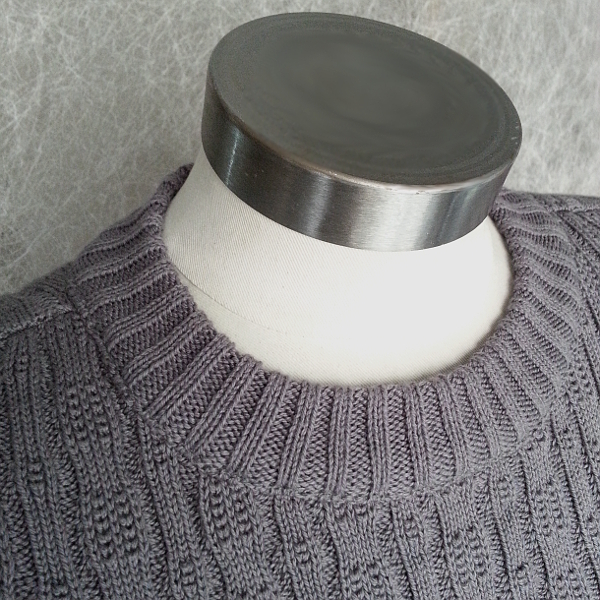 My neckband is folded over and encloses the raw edge at the neckline. I overlocked all seams using Maxilock Stretch [Amazon affiliate link] in the loopers. It’s a textured nylon thread that is “soft like yarn” as the label says. It’s similar to Woolly Nylon, except the Maxilock is slightly thinner and a little less expensive. I highly recommend that the thread be used with Handy Nets [Amazon affiliate link)] or similar thread socks. Otherwise, the thread just might slip below the cone, become tangled on the thread stand, and break... again and again and again. (I have a brief history of knitting with slippery, translucent, monofiliament thread. Thread socks were mandatory, so I should have known better when using the relatively slippery Maxilock Stretch.) 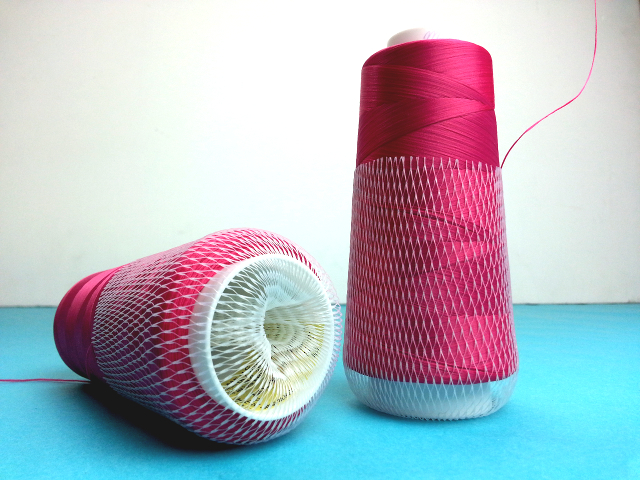 When using thread socks, be sure to tuck the excess net under and through the opening at the bottom of the cone, as in the picture below. The net should come no more than two-thirds of the way up the cone of thread. Once properly accessorized with nets, the thread sewed beautifully with no more breakage. I love this sweater, O.